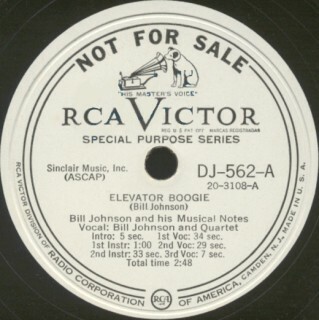 Above Right: DJ label image of RCA Victor "Elevator Boogie" recorded on 8/6/47 and released in September 1948. Vocal lead is by Bill Johnson. This is the tenth of eleven releases they had on RCA Victor (1947-48). The audio of "Half A Love", recorded on 3/5/47 and released on RCA Victor 20-2362 in July 1947, can be heard below. 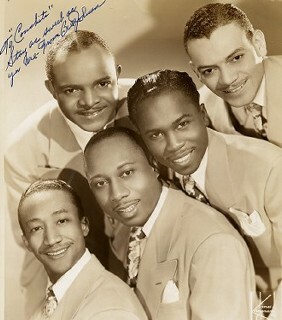 It was their fourth release on RCA Victor and features Gus Gordon singing the lead. Click on an option below to listen to "Elevator Boogie" by Bill Johnson And His Musical Notes using RealPlayer. Click on an option below to listen to "Half A Love" by Bill Johnson And His Musical Notes using RealPlayer. CLICK HERE TO LISTEN TO SOME PREVIOUS SELECTIONS BY BILL JOHNSON AND HIS MUSICAL NOTES.